Over the 2005 summer, I had the pleasure of working at IBM's Almaden Research Center in San Jose, California, under the leadership of John Barton and Stephen Farrell. The development team consisted of Chris Parker, Meng Mao and myself. We worked on a unique application which blended aspects of personal information management, social networking, and content management. The project was dubbed Enki, after the Sumerian God of Knowledge. The initial goal was to produce a pen-aware, mobile application that would provide on-the-go calendaring and meeting information. The target audience were people that spend a significant portion of their day in meetings: Executives, Doctors, Lawyers, etc. Many people take handwritten or typed notes in these meetings, but have no easy mechanism for associating these to the event. Handwritten notes are either discarded or filed away. Ultimately the information is either lost or inaccessible. People - Managers, government officials, family, visitors, co-workers, etc. Events - Meetings, lectures, phone conferences, dental appointments, etc. Topics - Bicycles, XYZ project status, financial results, bi-monthly research roundtable, etc. These three things were interrelated. Events generally have a purpose, and so they are associated with particular topics. People attend meetings, which makes a clear association. Attaching topics to people is harder to do automatically. One method we discussed was to assume people were involved with topics based on the events they attended. A flavor of this compromise is ultimately the route we chose. Our next thought was that once you have this complex graph of information, we can use the handwriting and audio capabilities of the tablet to let the user tag these object with their own data. Keywords could be extracted from the data using handwriting and speech recognition (both technologies we had access to at IBM). Something I thought would be groundbreaking, but most people thought was of dubious feasibility, was content-to-content relationships using text analytics (perhaps something as simple as keyword matching). Assuming that this could be pulled off, it would then be possible to make new associations, perhaps ones the user did not even know about. For example, a meeting about quantum computing is tagged with multiple written notes about the subject. Elsewhere in Enki there is a person that has a CV which included several references to quantum computing (perhaps a list of publications). Even though the meeting and person have no direct connection, a relationship could be inferred because of similar content. If this feature ran in real-time, perhaps as a user wrote notes or the tablet recorded audio pervasively, suggestions about related content could be shown to the user on-the-fly. Mostly because of time, this feature was dropped. 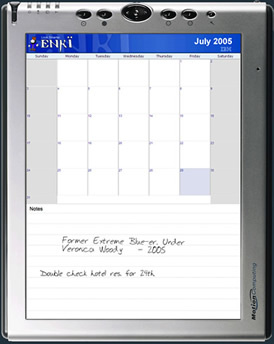 Enki was designed to interface with the user's existing email and calendaring application (pulling data only). 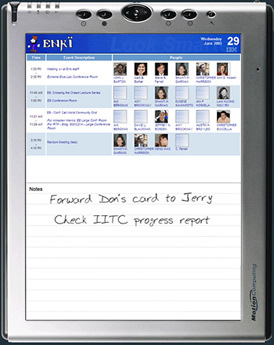 The wireless connection on the tablet PC meant that Enki could receive live data in a corporate setting. Left: A graph of objects in Enki and their relationships. Right: These object tagged with content. Using text analytics, relationships between un-connected content can be inferred. From this connection, Enki could infer relationships between objects (people, topics, events) even though they are not directly related. The dashed red line in the graph to the right shows this inference. 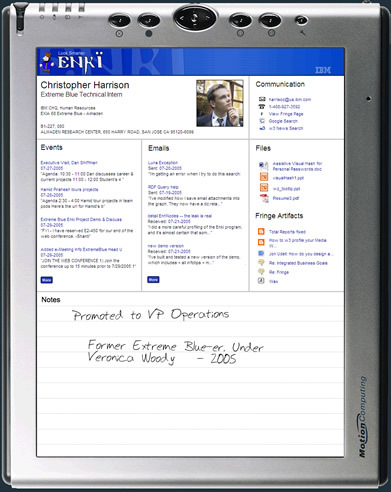 A screenshot of Enki's person view running on the tablet. The lower half of the screen is reserved for written notes about the person. The only thing absent from the image is a toolbar along the bottom of the screen that let you navigate to other functions. A button to provide additional writing space was also provided. The person's email was displayed, which launched the default email client when clicked. Clicking on the person's phone number fires up a VoIP softphone and calls the person on the tablet! You can also run a Google or w3 (IBM internal) search with a single click, which is pre-initialized with their full name. Tying into Lotus Notes, we could find every meeting the user and the selected person were both invited to. Only the four closest meetings are shown (that's both forward and backward in time from the current date). 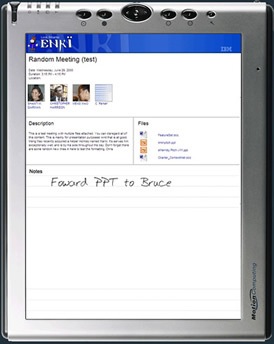 Users can click the blue "more" button to see expanded meeting history. 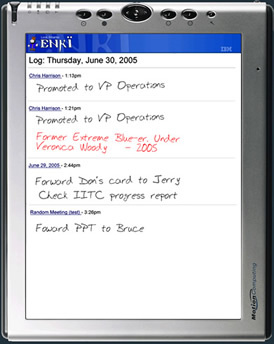 The first sentence or so of the meeting description was displayed along with the meeting name, date, and time. Clicking on an event forwards the user to the event view. Hovering the pen over an event shows the event's description. This section displayed the two most recent sent and received emails. The "more" button expanded the email history, and spit it into two columns: to and from. The first couple lines of the email were shown under the email subject and timestamp. Hovering over an email showed the body text of that email. This section was intended to display files the user had associated with the selected person. How great would it be if you could pull up any person's resume, presentations, reports, etc. and view it right there? However, a mechanism for doing this was cut from the project due to time. Rather than scrapping this useful feature entirely, we decided to pull files that were sent to the user as emails attachments. The added bonus was that this could be done and updated automatically. Clicking on a file opened it. Stephen Farrell had been (and still is) working on a very clever social networking engine called Fringe. This automatically fetched, processed, and indexed information relating to people. Some of the information it could show about a person included patents, publications, blog entries, comments, projects/activities, management chain, colleagues, pictures, and more. Enki tied into Fringe, and displayed a few items (called artifacts) about that particular person. The event name, time and location are shown in the header. This showed all of the people invited to the event. Clicking on a person takes the user to the person view of that person. Hovering the pen over a person's name or picture showed a abbreviated translucent person-view. A description of the event (if provided). This was primarily used as a navigation screen to jump between days and months rapidly. Events that lasted all day were shown inside the "day boxes". Notes could be written about the month. Hovering with the pen over a day showed a mini schedule for that day. Clicking on day forwards the user to the day view. All the events for the day were displayed (one per row). These were sorted by time, earliest starting first. The title and location of the event were shown, as well as the first 6 people in the meeting. If there was more than 6 attendees, a small "more attendees" button was displayed. Clicking the latter button or the event title forwarded users to the event view. Clicking a person would lead to the person view. There were several optional "markers" that could be attached to each event. This was to allow people to color-code or iconize their schedules. A few of the markers are shown below. Two automatic markers were the attachment icon, which was present if the meeting had attached files, and the ink icon, which appeared if event had associated written notes. Hovering over the ink marker showed a preview of the written text. The log view was one of the last significant features to make it into the Enki demo. Having built a relatively rich system to capture written (and audio) data about people and events (as well as months and days), a quick way to see all this data needed to be developed. The result was the log view, which took all of the notes for a single day, both written and audio, and presented them in a chronological format. Now, at a glance, a user could scan over all of their notes at the end of the day (or jump back to past dates) and look for important items and remaining to-dos. Users could jump back to the page the note was take on by clicking the title (located above each note). From there, they could make modifications (perhaps crossing out a to-do that was completed). Another interesting thing Enki does is show the changes (deltas) between notes on the same item. For example, on John Smith's page, a user writes, "Knows a lot about computers". The ink would be red in color. When the user returns to John's page later that day, the previously written text would show up in black. Now when a new note is added, perhaps "Ask John about new laptops", only this shows up in red. Although a nice side effect is that it increases the readability of the new text that is being added, the real importance is how this manifests in the log view. The user can easily see when notes were modified for a particular object; each change is timestamped and highlighted in red. Log View: The colors and layout differ from the final Enki version, but this graphic provides the basic idea. Audio clips were embedded directly into the page and were able to be played with a single click.